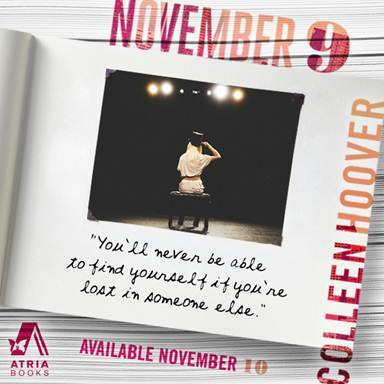 Colleen Hoover is a must read for me. Slammed is still one of my favorite books ever. 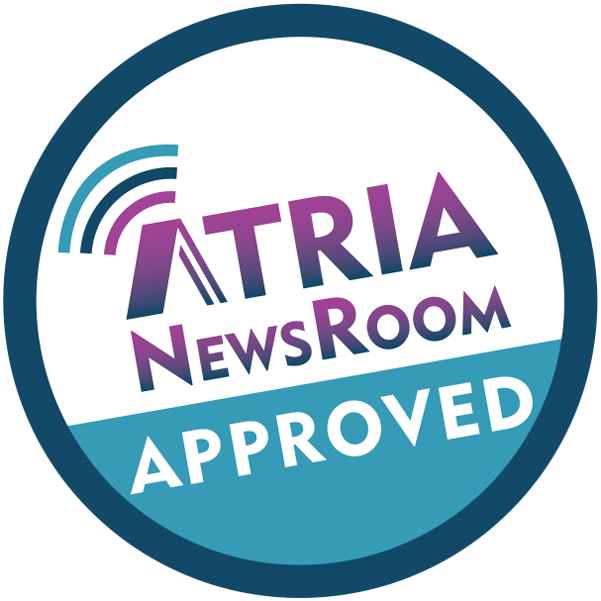 Starting November 9 was the perfect treat I needed. I have come to expect the unexpected from her stories and this book took me exactly there. I didn't read the blurb (and it was hard avoiding anything to do with it) because I like to be surprised. Oh yeah, I definitely was. Ben and Fallon meet the day she is moving away and they make a promise to meet again every year on the same day until it's the right time to be together. During their time off, there was to be no contact. No social media. Zero knowledge of the other. With that premise they were bound to run into trouble, weren't they? My heart broke up for them so many times but by the end of the journey it was put back together and I was left with a big smile on my face. Do yourself a favor, pick up this one and read it soon, just make sure you have nothing else scheduled for a few hours because walking away from it, is just NOT possible. 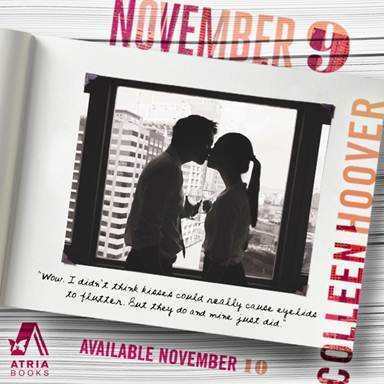 I always know I'm in for a special treat whenever I sit down to read one of Colleen Hoover's books. 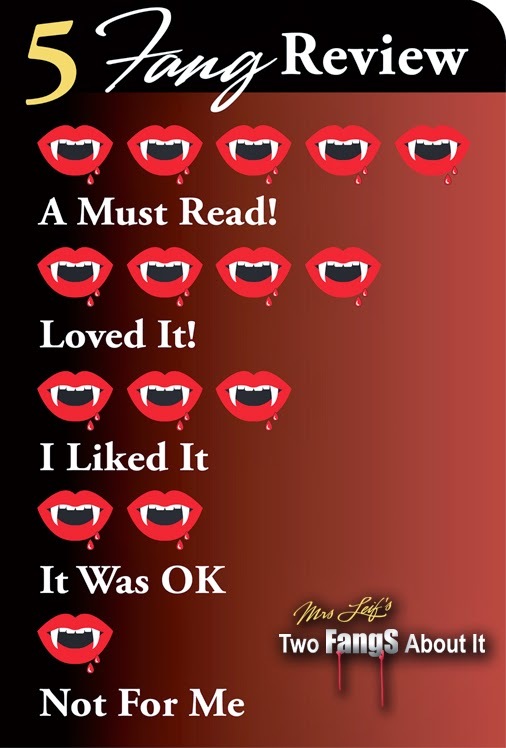 Her stories never lack originality and her writing style is always impeccable. 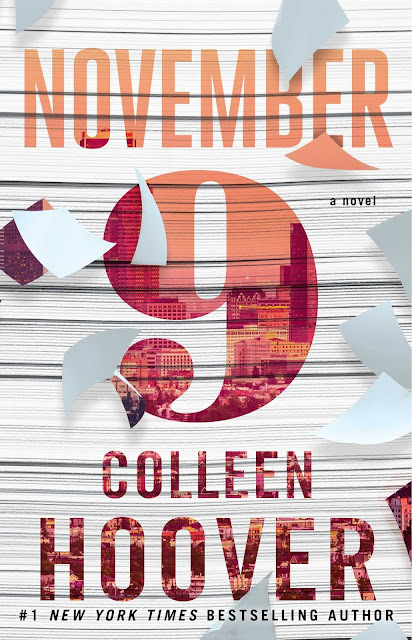 When I was finally able to read November 9 I completely devoured it! I tried to give myself a pep talk beforehand to slow myself down but that was no use, no use at all. Fallon is scheduled to leave California for New York. On the morning of her last day in Los Angeles she meets Ben. Considering they meet in a very unconventional way, they seem to hit it off instantly. Not wanting their time together to end they spend her last day together, but it seems the only thing that has done is make them not want to end this special friendship they've begun. When they come up with the idea to meet every year on November 9th they think it's a brilliant idea. What they didn't think about is how things could drastically change in the time they spend apart. As the years pass both Fallon and Ben have to deal with the complications of their lives without contact with each other. The attraction is there, but Fallon has so much she wants to accomplish and she knows that Ben has a novel to write. There's also the fact that there might be a secret that Ben has been hiding. When it's all said and done can they both finally move on from their pasts, or will it be too little too late? I loved Fallon and Ben right away. They are those perfect characters that Colleen never fails to give us. Fallon has been through a lot in the last two years so she has a tough exterior but it's only a defense mechanism. Ben somehow seems to know how to bring out her softer side and he doesn't shy away from putting in the work. He is the perfect, down to earth, witty guy who always seems to say the right thing. I. Just. Love. Him! 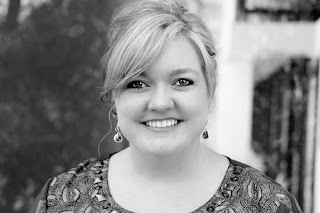 When it comes to Colleen Hoover I am never disappointed. Her stories never fail to engage me. I am lost in her world and don't mind one bit! Nope, not one iota. A round of applause for another amazingly creative and superbly written work of art. When I start a new book by Colleen Hoover I try to go in completely blind. 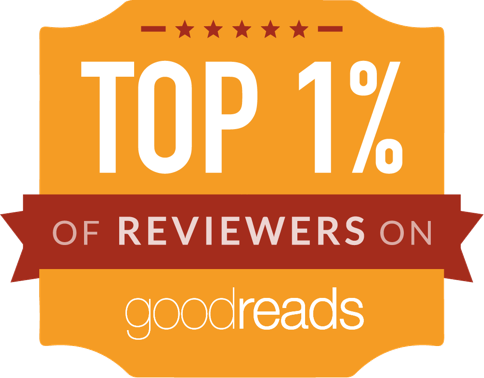 I don’t read excerpts, I don’t read teasers or even the synopsis. I trust Colleen’s unique story telling and I know I’ll always be surprised by the originality. November 9 did not disappoint. Because I like to be surprised when Colleen’s novels, I’m going to be as vague as possible: Fallon lost all sense of security one tragic night. When she meets Ben her whole world changes. She slowly gets her confidence back through the arrangement she and Ben have. Then in Hoover style the plot twists happen and everything explodes. So basically that’s the gist of it. 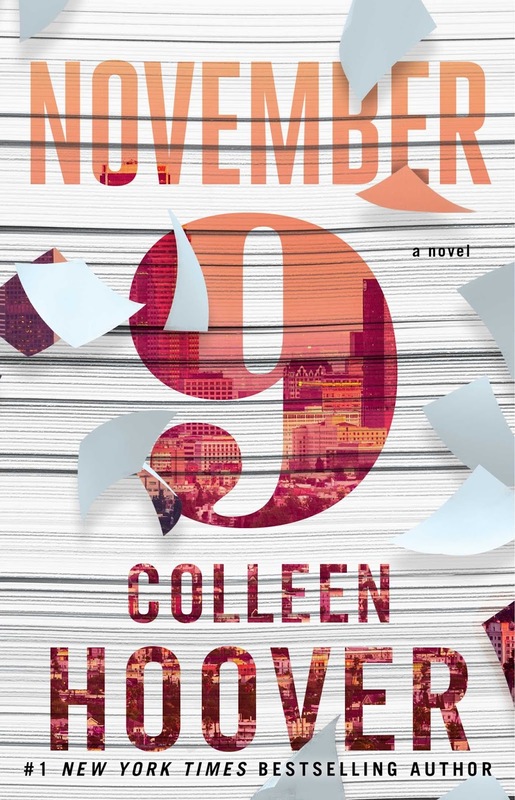 I have to say that while I do love every single one of Colleen’s books, NOVEMBER 9 ties with my favorite (along with MAYBE SOMEDAY). The originality was once again evident with the way the story unfolded. How she comes up with these ideas I’ll never know, but I hope they never stop coming. I read the last two thirds of this book on the airplane, which was a huge mistake. I had tears rolling down my face as I tried to discretely wipe my eyes. My heart was breaking with every single beautiful and hurtful word. . . and I loved every minute of it. If you’ve never read a book by Colleen Hoover you are missing out on life. Her writing is flawless and her stories are life changing. Do yourself a favor and pick up one of her books NOW! Visit www.November9book.com for more info.